Join in the fun as we kick off 2018 Sale-A-Bration! Check out all the blogs for lots of inspiration using the NEW Sale-A-Bration products. There is a list of all the participating blogs along the blog hop near the bottom of my post. Now for my project for the Kick Off Blog Hop! For my project, I chose to use the FREE Sale-A-Bration Party Pandas stamp set. The pandas are so stinkin' cute. This is just one of 3 panda bears in the stamp set as well as 4 additional stamps! 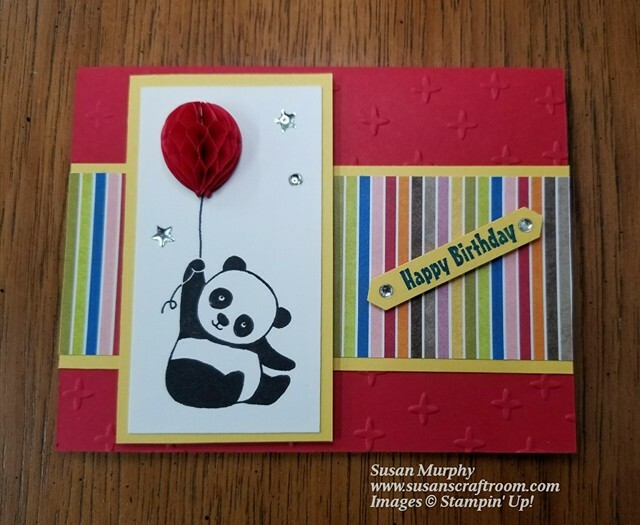 As soon as I saw this stamp set, I knew I wanted to use the Balloon Honeycomb Embellishments as the balloon on a card. The silver Metallic Enamel Shapes add the perfect bling to the card. I put a couple of the stars and a circle on the stamped piece and added circles to the ends of the sentiment. Whisper White Cardstock: 3 3/4" x 2"
Birthday Memories Designer Series paper: 5 1/2" x 2"
TIP: Before using the panda bear stamps, use a pencil eraser to rub over the stamp. Then clean the stamp using the Stampin' Scrub & Stampin' Mist Stamp Cleaner. The stamp will then stamp a better image. At the bottom of my post is the list of products used in addition to the Party Panda stamp set. during the annual Sale-A-Bration promotion!